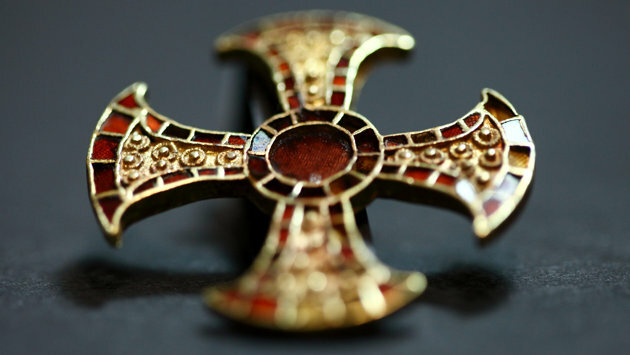 Scientists have discovered the remains of what is thought to be one of Britain's first ever Christians after unearthing an "excessively rare" 1,400 year old Anglo-Saxon burial site in Cambridgeshire. 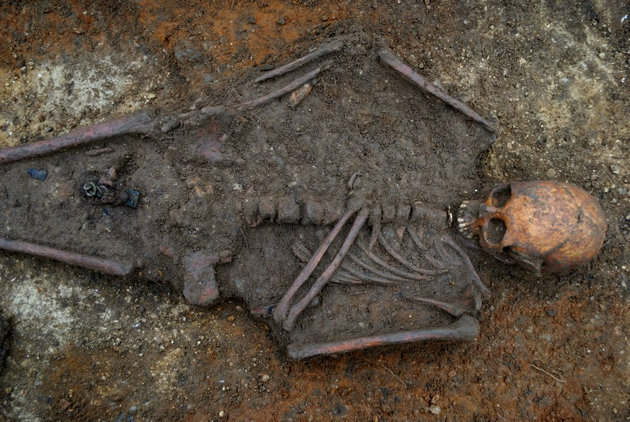 The amazing grave in Trumpington Meadows contains the skeletal remains of a 16-year-old female catholic (OODE Note: "orthodox")* convert lying on an ornamental bed clutching a gold and garnet cross. It is believed the girl, from the 7th century AD, was a member of nobility, persuaded to join the Christian faith after the Pope (Gregory Dialogus) dispatched St Augustine to England in 597AD. St Augustine was a benedictine monk, known as the ‘Apostle to the English’, whose job was to convert Anglo-Saxon pagan kings and their families. Dr Sam Lewsey, an expert on the period, said: "This is an excessively rare discovery. It is the most amazing find I have ever encountered. "Christian conversion began at the top and percolated down. To be buried in this elaborate way, with such a valuable artefact, tells us that this girl was probably nobility or even royalty. "This cross is the kind of material culture that was in circulation at the highest sphere of society." " The term "catholic" as originally used to define the Church (as early as the first decades of the second century) was a definition of quality rather than quantity. Calling the Church catholic means to define how it is, namely, full and complete, all-embracing, and with nothing lacking. Even before the Church was spread over the world, it was defined as catholic. The original Jerusalem Church of the apostles, or the early city-churches of Antioch, Ephesus, Corinth, or Rome, were catholic. These churches were catholic -- as is each and every Orthodox church today --because nothing essential was lacking for them to be the genuine Church of Christ. God Himself is fully revealed and present in each church through Christ and the Holy Spirit, acting in the local community of believers with its apostolic doctrine, ministry (hierarchy), and sacraments, thus requiring nothing to be added to it in order for it to participate fully in the Kingdom of God. " Catholicity is sometimes confused with universality —the idea that the Christian faith is for all men. However, the word was originally used to denote the true Church among a growing horde of heretics who had removed elements from the faith which they disliked, refashioning Christian belief to their pleasure. Catholicity is a qualitative mark: the quality of the whole faith handed down from the apostles. 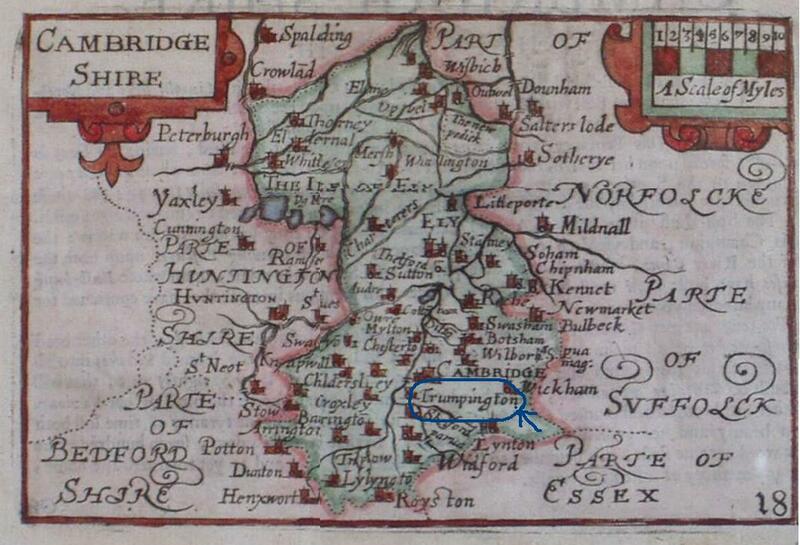 Old English map showing Trumpington (circled), in Cambridgeshire. Article published in English on: 19-3-2012.